Project: Based in Austin, Texas at the Lyndon Baines Johnson Presidential Library, researched in the photo archive on assignment to the publisher and photo editor for a 25-volume comprehensive photo history of the Vietnam War. Images selected included documentation of war’s escalation, stateside unrest, and major historic participants, from Johnson and other elected officials to Defense Department war elites. Detail: Clark Dougan, et.al. 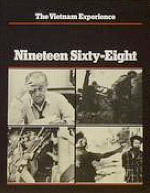 THE VIETNAM EXPERIENCE: Nineteen Sixty-Eight. Boston: Time-Life/Boston Publishing Co., 1983.